#SPC14 sessions spreadsheet updated, preparation tips and holiday advice wanted! 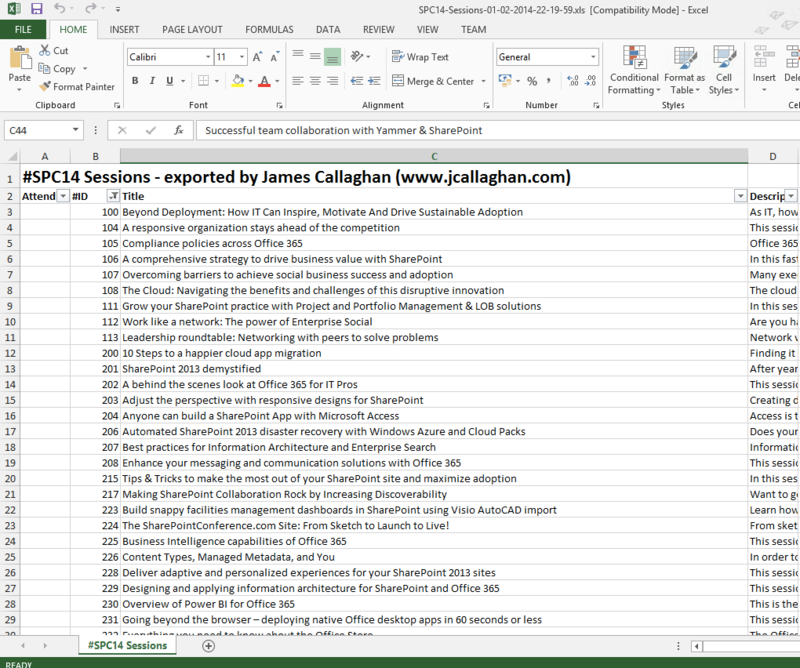 Update: 23/02/2014 I’ve updated the #SPC14 sessions spreadsheet one last time to include some missed sessions and a request to have sortable start and end dates. With just under two weeks left to go until #SPC14 I would imagine a lot of you are running out of time fast trying to finalise your plans for the conference. To help I have updated my #SPC14 session spreadsheet again – it now includes time and room information for all the available sessions (as of 17/02/2014). The spreadsheet of all the SPC14 sessions can be downloaded with this link. Since this is my first conference I’ve done plenty of reading about what to expect and how to prepare etc. There are some really great posts on Yammer and LinkedIn as well as guides such as Mark Freeman’s survival and readiness guide. Rather than rewrite what is already on the web I thought I would share a summary of the tips I keep seeing repeatedly. Firstly I’ve filled my Outlook calendar with all the sessions I want to attend (including alternatives incase a session is not what I had thought it would be), meetings with partners and peers, agenda information such as #SPC14 organised events, social events I’m attending and breakfast and lunch times. Participate in the community – join the #SPC14 Yammer network, LinkedIn network, follow the #SPC14 hashtag on Twitter and Facebook group. Reach out to your peers or those people’s blogs you regularly visit and see if you can meet-up to say hello and thanks for the help! Your welcome to ping me an email (james@jcallaghan.com) or a tweet (@jamescallaghan). Make use of the MySPC App that has just been launched to organise your schedule beyond the capabilities of the spreadsheet I have produced. Have your information cached or printed so that you can use it offline – I have read that the internet was extremely bad at previous conferences however it seems that Microsoft are not going to allow previous problems to be repeated this year. Make sure you visit the exhibition hall – you never know who you might see not forgetting the #SPC14 swag you might find! Post conference holiday advice wanted! Can you offer us any advice? My partner and 6 month old girl are joining me – we’re flying in from the UK and having a short holiday after the conference. 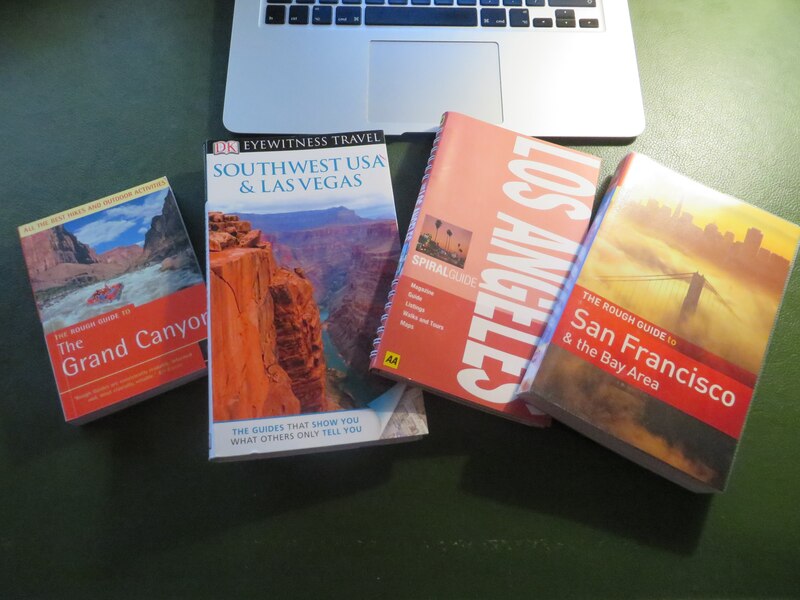 We’re going to drive over to the Grand Canyon before heading across to Los Angeles and then San Francisco before flying home. I’m looking for any great tips or suggestions for things we should do that we might have missed from the travel guides we are reading. I’ve been astonished at how popular my spreadsheet has been – I’ve had over 2,500 unique visitors since publishing it…that’s approximately 25% of the conference attendees! Please do drop me a line or a tweet (@jamescallaghan) if you want to say hello! I look forward to seeing some of you at the conference. Next Next post: My #SPC14 treasure map – mapping out the Expo hall!